Note: Anandabazar has changed their server configuration in such a way that the Helper no longer works as well as it once did. Images no longer appear in the articles. I'm probably going to have to retire the Helper because working around these problems is too difficult. I recommend that you try the Bangla-Tangla Chrome Extension, which does the same job for any web site. When I'm reading in Bangla I have to look up a lot of words. So I wrote a program to make life a little easier. 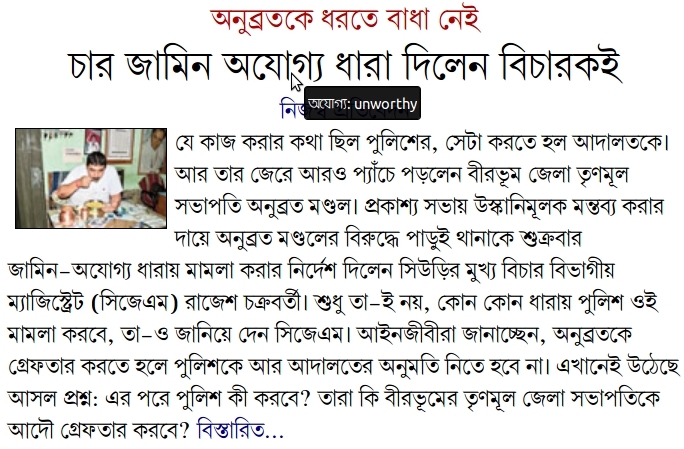 Using my system you can read Anandabazar and hover the mouse over any word to see the definition. Unfortunately, of the tens of thousands of words that may come up, the system's dictionary only contains a few thousand so far. If the word is unknown then a question mark is displayed. I'm slowly expanding the dictionary. But you can also click on the word to look it up in my dictionary as well as the two Samsad dictionaries. Text inside a hyperlink does not get annotated, and clicking the text will follow the link, not show a word definition. On the main page of Anandabazar, most of the text is inside hyperlinks, so the Helper doesn't help very much. But if you click on an article and go to the page for the article, all of the words in the body of the article will be annotated. If the browser is still busy loading the page the hovering won't work. Sometimes it take a while to fetch all the stuff dangling off the page. Sometimes the browser refuses to show the definitions when you hover over the words. Usually waiting solves the problem. Reloading the page usually solves the problem too.